A residential coastal community in San Pedro began sliding into the ocean in 1929. Now, the remnants of the neighborhood are known as the "Sunken City." A panoramic view shows the six-acre Sunken City in San Pedro on Tuesday, June 16, 2015. 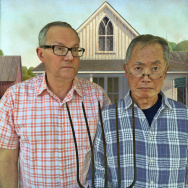 The property is currently closed to the public. Anyone visiting the Sunken City in San Pedro goes through a hole in a fence, past "no trespassing" signs. 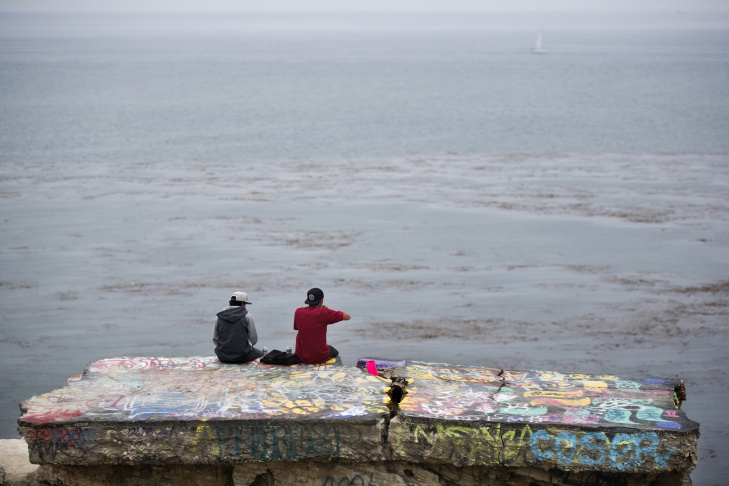 A new proposal may soon open the Sunken City in San Pedro to visitors during daylight hours. In May, LA City Councilman Joe Buscaino asked parks officials to consider allowing visitors into the Sunken City in San Pedro. The Sunken City now spans about six acres in San Pedro at the eastern end of Point Fermin Park. 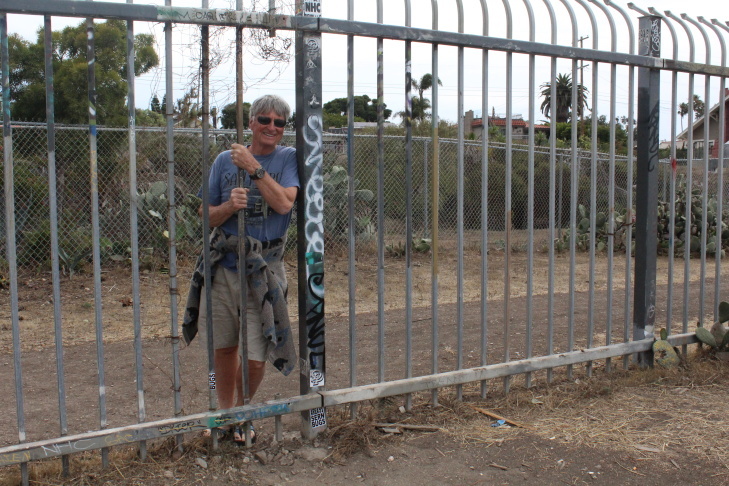 Graham Robertson shows the hole in the fence that makes trespassing easy into the Sunken City. 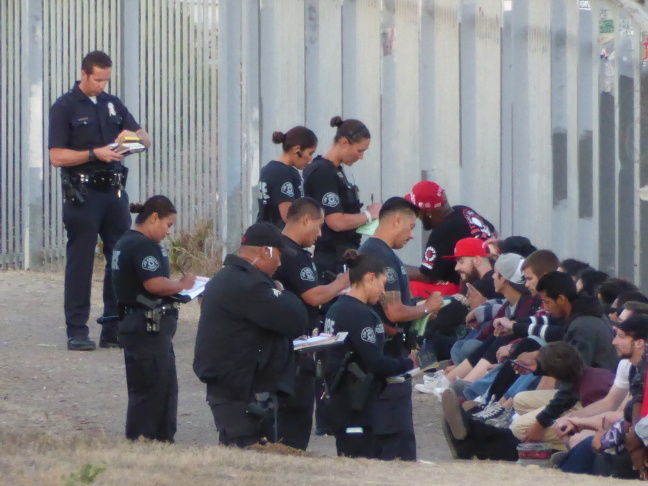 Police issue tickets to teenagers trespassing in Sunken City of San Pedro on June 26, 2015. 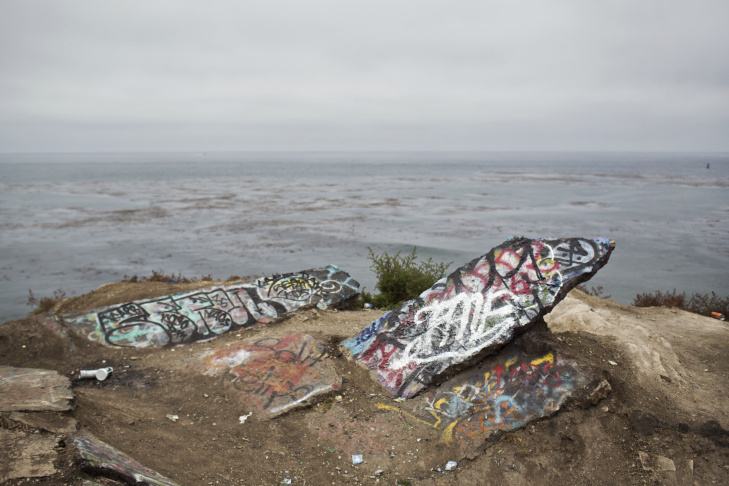 Neighbors are pushing to open Sunken City to the public during the day. 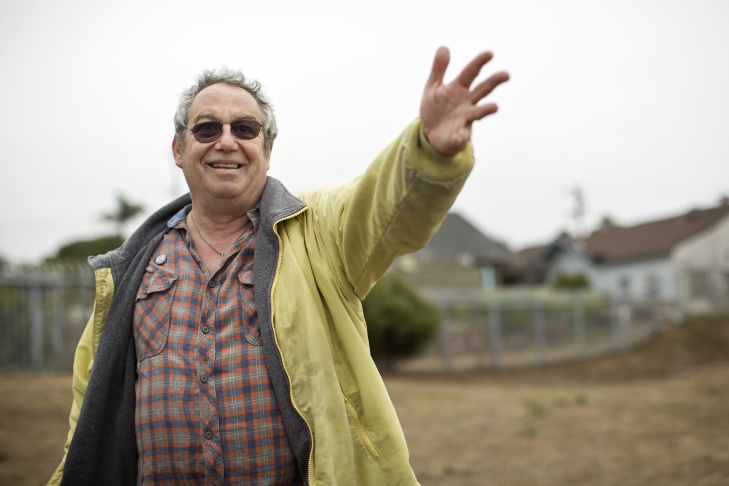 Musician Mike Watt grew up in San Pedro and remembers frequenting the Sunken City. The Sunken City appears in the lyrics for his song, "Petro Bound!" 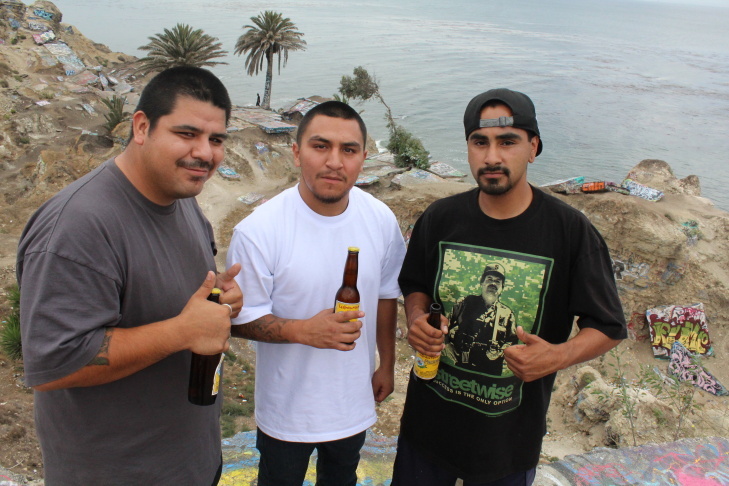 From left, Samuel Young, Angel Sosa, and Philip Delgado, of Montebello, stand in front of the Sunken City. More than 80 years ago, a neighborhood in San Pedro started falling toward the sea, and Sunken City was born. Today, the 6-acre slide area is full of broken road and street art. 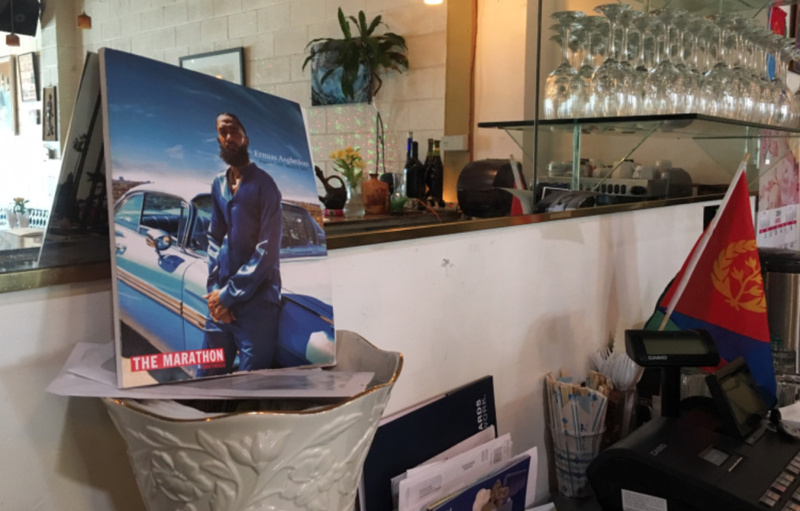 An 8-foot fence went up in the ‘80s, but it hasn’t kept people out. Neighbors say it’s drawing the right and wrong kind of people, including a lot of late-night partiers. Now, they want Sunken City to return to the people of San Pedro as a well-regulated city park. Robertson, who taught high school physics and engineering before retiring a few years ago, closely studied Sunken City when he moved to the area. He had to know if he was building a house on shaky ground. He wasn't, but he learned the story of Sunken City goes back a lot longer than you might think. 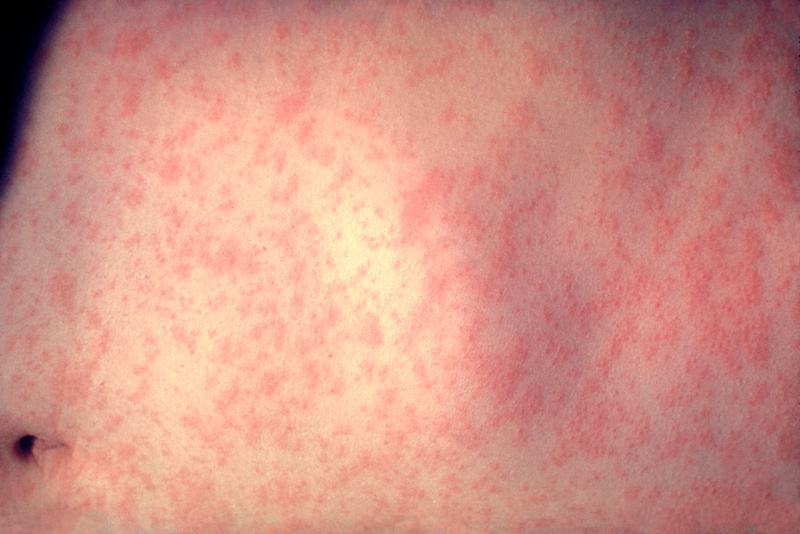 “There was a volcano in Palos Verdes about 10 million years ago, and it blew ash everywhere,” Robertson said. The ash that landed underneath where Sunken City is now was deep and thick – and subject to change. It seems that, when they built a hotel, beach bungalows, and Red Car tracks here in the early 1900s, land developers didn’t know this. But they found out in 1929. That’s when the land started to move – slowly, but surely – toward the ocean. There was enough time to move out and demolish most of the buildings and homes, but by the early '30s, the road, rails, and foundations had all dropped 80 to 90 feet closer to sea level. “The road was so well built that you can still see it. You can still see the curb, the sidewalks, and the street trees are still here. And, where the concrete blocks are, they’re protecting the soft rock underneath – just like the Grand Canyon has the cap rock — so wherever the pieces of road are, they’re higher,” Robertson said. 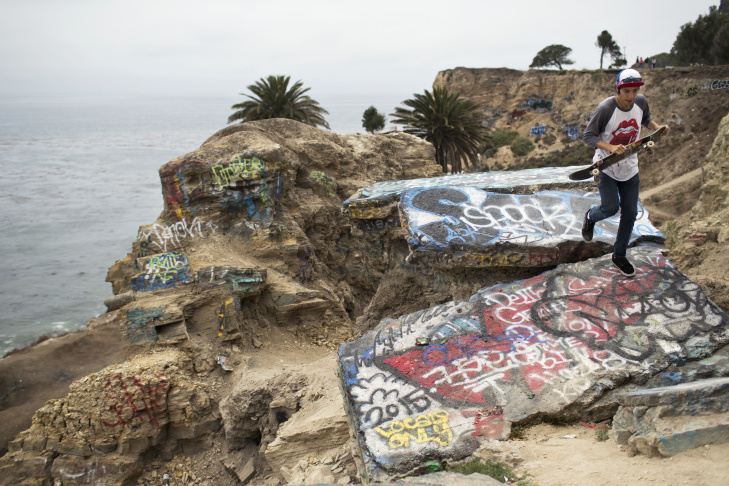 Today, despite the fence, Sunken City has become one of L.A.'s top spots for street art, with tags seen on remnants of road, palm trees, and the cliff face. Robertson and his fellow neighbors of Sunken City say they don’t mind the street art, as long as it remains in Sunken City. What they do mind is late-night bonfires and parties that disturb this otherwise tranquil neighborhood. 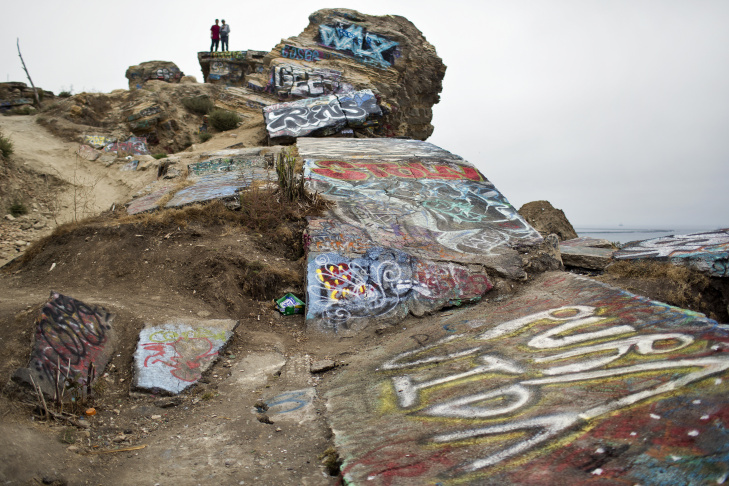 “What our group wants is for Sunken City to become a part of Point Fermin Park, administered by Recreation and Parks,” Robertson said. He and his group of 18 neighbors, called the Sunken City Watch, have confronted the coastal commission, filled city council meetings and circulated petitions to make the park legally open during the day and closed – with enforcement – at night. In May, Los Angeles City Councilman Joe Buscaino, who represents San Pedro, asked city attorneys to consider Robertson and his neighbors’ request to open Sunken City. The way Sunken City is now, the neighbors argue, is anything but closed. “They pretend they can keep teenagers out, and all it does is keep older people out. The kids are there just — in fact now that we’re on social media, there are more kids than there ever have been,” Robertson said. One older person who could not be kept out and recently entered Sunken City through a hole in the fence was Mike Watt, punk-rock bassist and founding member of the Minutemen. 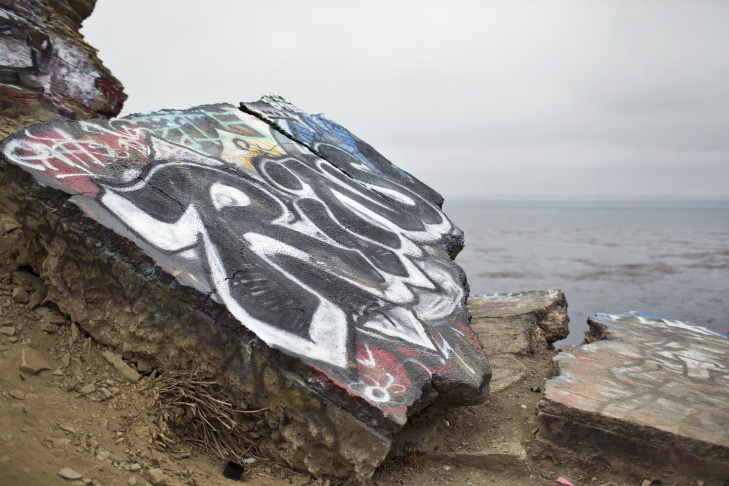 Watt still lives in San Pedro and still visits Sunken City, just as he did growing up in the '60s and '70s. Then, there was no fence and fewer people. Sunken City made enough of an impression for Watt to write about it in “O’er the town of Pedro,” a song performed by fIREHOSE. 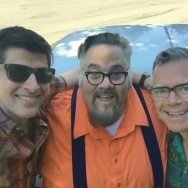 Listen to "O'er the Town of Pedro"
It’s inspired many others, too, including hundreds of street artists, selfie-takers and now, community activists, fighting to bring back Sunken City. Song of the week: Deepakalypse - "Drummers"